Leased Line Services to supercharge your business. Solution IP are data and connectivity experts, and our Bristol based team understand that for some companies, staying online 24/7 is business critical. This is why we recommend our fully managed Leased Line services. Leased Lines provide you with your own and exclusive high-speed, high-performance connection that isn’t shared with anyone else. We provide a 100% Service Level Agreement* against it too, for complete peace of mind. 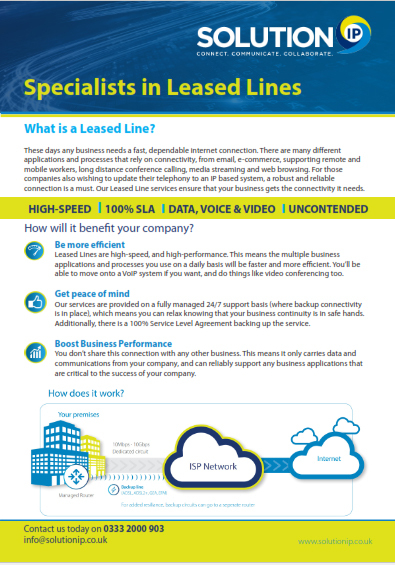 Leased Lines for Business- what are the benefits for your company? Leased Lines are high-speed, and high-performance. This means the multiple business applications and processes you use on a daily basis will be faster and more efficient. You’ll be able to move onto a VoIP system if you want, and do things like video conferencing too. Our services are provided on a 24/7 support and monitoring basis (where backup connectivity is in place), which means you can relax knowing that your business continuity is in safe hands. Additionally, hardware is fully managed and there is a 100% Service Level Agreement backing up the service. You don’t share this connection with any other business. This means it only carries data and communications from your company, and can reliably support any business applications that are critical to the success of your company. A Leased Line is a permanent connection between two site locations, or from your premises to the internet network. It is a dedicated, private line and only carries communications and traffic from your company. Upload and download speeds are equal, meaning you can achieve more during a business day. This, coupled with the 100% SLA*, means it is a reliable choice for businesses who are also looking for a solid infrastructure to help them grow and maintain service quality. We usually recommend back-up connectivity to maximise the service and make the most of the SLA. We can provide this in the form of ADSL or ADSL2+, a GEA or EFM connection. The line can be used for data, video and voice. High speed connections of up to 1Gig are available. With Business video conferencing also possible via handheld device, Mac or PC, and supported by Android and IOS, this means that anyone in your organisation working on a BYOD basis will be able to take part in a conference using their own device easily. Our customer care team is based in Bristol, in the UK. *This SLA only applies when backup connectivity is in place. What are the main features of a Leased Line? Interested in Leased Lines? Contact us today! 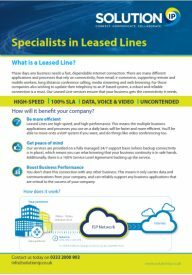 Fill in the form to download the Leased Lines Factsheet!